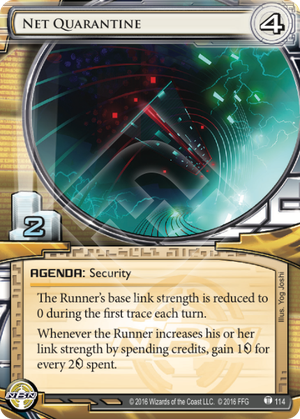 The Runner's base link strength is reduced to 0 during the first trace each turn. Whenever the Runner increases his or her link strength by spending credits, gain 1credit for every 2credit spent. Does the base link strength reduction include any link from installed cards? When the first trace on a turn occurs with Net Quarantine scored, do cloud breakers then cost MU (and subsequently must be trashed if the Runner is over their memory limit)? No. Net Quarantine reduces the Runner’s base link strength, which is the strength the Runner starts a trace with not the Runner’s current link. This IS a crazy-powerful agenda if scored. Moreover, it works with Media Blitz making it, simply, a crazy-powerful agenda. While less interesting for the rush NBNers this is a very interesting card for decks using Arya, Restructured Datapool and preferably its combination. In combination with 2 creds on first trace, this means you erase an advantage of 0-5 creds of Runner link, and match that with a trace of 4+X for RDP, and a relative gain of 2-6 (1 gain for you, 1 loss for Runner) depending on the amount of Arya you have standing. That's just massive. This and the amount of fun tracer ice that has come out suggests that this kind of slow and tracy NBN deck could have a future. Wow, this is a crazy-powerful agenda if scored. The question is, will anyone bother to use it? 2/4 agendas often have some pretty cool effects. (Nisei MK II, for example, singlehandedly enabled a lot of Jinteki glacier builds.) This is probably at around the same power level, but it's less clear how it will fit into a deck. The problem is that NBN has a lot of really good agendas already, and this has to compete with all of them. AstroScript Pilot Program is almost an auto-include, even if it's limited to one-per-deck. Project Beale is really solid, just because 3/2 agendas are precious. And Explode-a-palooza is really popular, because of it's "consolation prize" of 5 when stolen. So where does that leave Net Quarantine? "Mostly unused", most likely. But for a deck specialized around traces, it has the potential to be crushing for runners. High link runners are becoming a lot more commonplace. Security Nexus gives runners a reason to build link, even if they're not in a trace-heavy meta. Being able to zero out their link is a big deal, even if it is only for the first trace of the run. I don't think that this card will see widespread play, but I think it has the potential to really re-enable trace-heavy decks, even in an environment where 5-link runners are not unheard of. For bonus points, combine with Surveillance Sweep. I love this agenda! With link being so hot right now, especially with Nexus Kate, this could be devastating against those kinds runner of decks. NBN: Making News and Surveillance Sweep along with a few good tracer ice like Resistor, Archangel or Assassin will work wonders with this card. Either you will win most of the traces or make a ton of money. Or win the trace after the trace where you made a ton of money. It does work every turn! However, this is more of a silver bullet card than anything else and it's an NBN 4 for 2 agenda, so it will be hard to put more than 1 or 2 in most corp decks. You probably won't be able to build a deck around it, but you could include 1 of these as a nasty surprise. Have fun!